Some time this fall construction workers will start turning Allen Street between Delaware and Main into a deep trench, beginning a multi-million dollar project to transform the street with new pavement, new underground utilities and a new parking configuration. The project will take several years, but major change is coming to Allen Street. City Engineer Michael Finn says its going to be a complicated project working through a section of Allen Street near the Buffalo Niagara Medical Campus that is flanked by bars, restaurants and shops. "We're totally going to dig up the roadway, replace the city-owned utilities. The private utilities are also going to take the opportunity to replace their facilities as well, so that the roadway will be set for the next 30 years," Finn said. "We're also modifying the streetscape by making the parking more flexible than it is right now." A noticeable difference will be the absence of a curb line as the street and sidewalk will be on the same level. 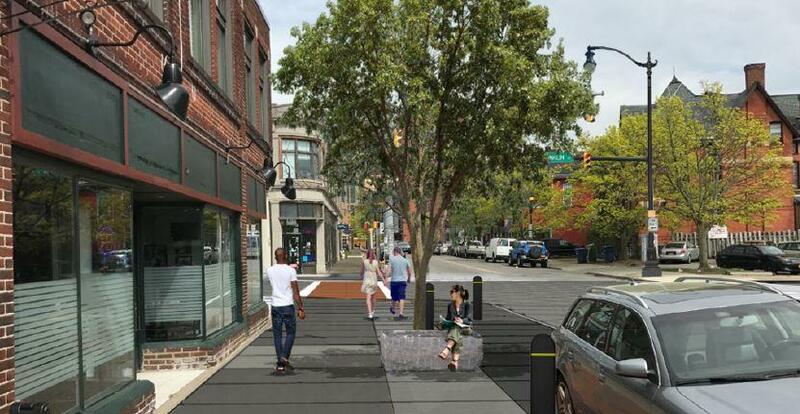 Moveable bollards will be erected to keep cars from sliding onto the sidewalk. That can be modified to allow for specific events. "Everything that is going on the medical campus is drawing a lot of attention to the entire area and there is a desire on the city side to make sure that the success of the medical campus is spilling into the neighborhoods on both sides of the medical campus," Finn said. Finn acknowledges the work will complicate matters along one of the city's busiest streets. A project engineer is expected to be on-site during work to help patrons access the street's many businesses. "We developed a plan to make sure that they'll always have at least pedestrian access to their facilities," Finn said. "From a design standpoint, it was just a matter of working with the community and developing a consensus that everyone could feel good about. Which we've done that." The final touches on the street renovation, including tree plantings, should be finished in 2020.